Sorry everyone you have to listen to me (Philip) for this post. 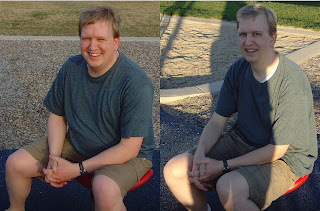 On Monday May 21, 2012 I began a journey to improve my health and loose some weight. It is now 5 months later and I'm roughly 60 pounds lighter. I'd like to give a large part of the credit to my amazing wife for convincing me to keep track of my daily calories and introducing me to myfitnesspal. For all the time spent calculating and entering our daily meals (especially with such an obsessively detailed husband who insists on insane levels of accuracy). And for the extra time spent alone with 3 very energetic boys providing me the time to exercise, especially on Wednesday nights (quite often bathing them alone) as I played basketball. You look great! I had no idea you were doing that and hadn't seen you in a while. I seriously thought your brother was visiting when I saw you pass by a couple weeks ago at church. Congrats!